For spring break this year, we decided on a favorite among the locals and made the 7-hour drive south to the beach in Destin, Florida. 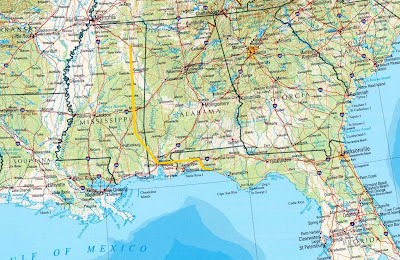 Destin is in the northwest part of Florida, way out on the Panhandle, a region that is closer both geographically and culturally to Alabama and Mississippi than it is to some other regions of Florida. Indeed, there were plenty of license plates from those states, as well as from Tennessee, Arkansas, Louisiana, and even from as far away as Missouri and Texas. A friend of Rob's from out west even joked about Destin as the "Redneck Riviera", though most people claim that the real "Redneck Riviera" is 60 miles further west in Gulf Shores, Alabama. In fact, Destin is also commonly known as the "Emarald Coast" (due to its emerald-colored waters and sugar-white sand beaches) and "The World's Luckiest Fishing Village" (since it was a tiny fishing village only a generation ago). The beach is superb in the Destin area, and the vibe is generally upscale, with lots of high-end condos, resorts, shopping and restaurants spread out over what were probably pristine rural beaches and woodlands less than 30 years ago. The beaches aren't too crowded this time of year, since the climate isn't quite so tropical here. During our stay the cloudy and windy conditions kept us mostly out of the water and off the beach. At least the pool was heated! We stayed with Carley's family in a nice condo outside of Destin, on Santa Rosa Beach. In the photo above, you can see Carley's brother and some friends on our 4th-floor balcony of the building behind Carley and her mom. The best part of the beach stay was getting to see Carley's brother Barrett (who is in grad school in Orlando) and spending time together as a family.